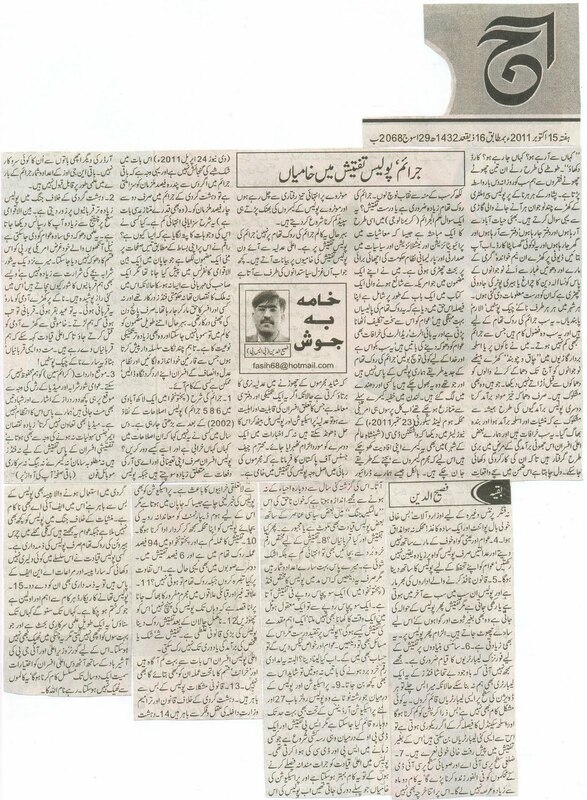 [Pak-Media] Mr. Fasihuddin (PSP) column on "Jareim, Police Taftheesh main Khamiyan"
Please find the attached column of Mr. Fasihuddin (PSP) on Crime and Demerits in the Police Investigationspublished in Daily Aaj, Peshawar on October 15, 2011, Saturday. 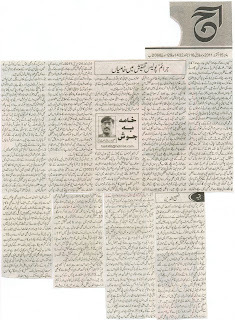 The writer discusses about the demerits of Police investigations and elaborated that as the nature of crime changes with the passage of time, so the investigation procedure should also be changed and new techniques should be introduced. You may find the said column on the following online link..
You may also send and share it with your friends, if it is of their interest. Warsak Road, PESHAWAR, Khyber Pakhtoonkhwa, Pakistan. Ali Akbar House, G-8 Markaz, Islamabad, Pakistan.